San Francisco has a long, dark history with murders, mysteries, and mayhem. All of these events fuel our fun and interesting ghost tours. You can walk through Chinatown to learn about its mysterious past, walk through the Haight to hear its ghost stories, and even head out to Alcatraz at night to visit one of the most ghostly spots in the city. You will also find two special tours in October for Halloween. One is a Segway tour that you will show you the dark hidden alleys of some of our top districts. The other is a special tour of City Hall offered by SF City Guides. This one is only once a year and it's super popular, so make sure to arrive early (and it's free!). Most of these tours are informational and not meant to scare you too much (although the stories are dark and chilling)! All will help you understand more about the people and places that make this city one of the most haunted in the US! Union Square is one of the most popular places for tourists to visit, but did you know it has a long, dark history? On this tour, you will stop sights where a brutal murder took place as well as several places where ghosts have been reported. You will also walk by buildings that once housed SF's most visited brothels. You will learn all about the Pinecrest Dinner's 'poached eggs' murder. You will also walk past the Curran Theatre and the St. Francis Hotel and learn about their secret past. This 90 minute tour takes you to the dark side and is only recommend for adults. It runs most days after dark through Union Square. Walk through one of SF's first and most famous districts, Nob Hill. On this walking tour, you will learn more about the dark events that occurred over time in places such as the Fairmont Hotel, the Pacific Union Club, Grace Cathedral, and the Mark Hopkins Intercontinental Hotel. This two hour tour that starts at 8pm and ends at 10pm. Let's start with one of my favorites, Alcatraz. 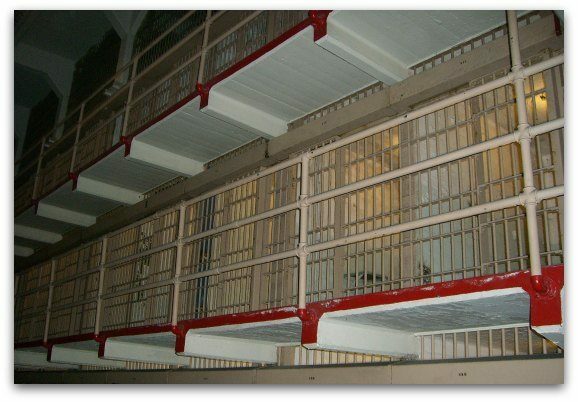 This former federal prison housed some of the most notorious criminals in the U.S. including Al Capone, Robert Stroud (the Birdman), and George "Machine Gun" Kelly. Before it was a federal prison, it was a U.S. Military Prison. During both periods, many prisoners died on the island and now there are reports of mysterious noises and occurrences. This isn't technically a ghost tour in San Francisco, but heading over at night is the best way to experience this haunted attraction. The SF Ghost Hunt is a walking tour that takes you through beautiful tree lined Victorian Streets in SF's Pacific Heights district. As you walk, you will hear ghost stories based on documented research, touch eerie haunted artifacts, and experience the mysteries that surround these gorgeous haunted mansions. The tour runs most nights of the year from February to December. It starts at the corner of Octavia and Bush Streets. Reservations are now required. The Haunted Haight Walking Tour teaches you all about supernatural occurrences and mysterious events reported in SF's Haight Ashbury District. As you tour the neighborhood, you will also walk past the locations where some of SF's most infamous murderers and cult leaders used to live. The tour starts at 7pm and runs mostly on Saturdays. Click the link below for exact dates and information on how to register. This journey is part ghost tour, part history tour and all around fun. Your tour begins with a 40 to 45 minute lesson on the Segway so you are comfortable with it before you begin. You will then venture your way around San Francisco. You will explore the back alleys of Chinatown. You will find out more about the fortunes made during the 1849 Goldrush. You will also hear ghost and horror stories from the places you pass by in Chinatown, North Beach, and Fisherman's Wharf. It will be a night that you will never forget! >> Find tickets still available on Viator! This is one of my favorite Halloween San Francisco walking tours. From the outside, few realize the history and ghostly stories that lie inside San Francisco's City Hall. From the assassination of Harvey Milk and Mayor Mascone to exhumed remains, the Ghost Walk at City Hall will fill you in on all the jaw dropping tales about this iconic building. You will also hear about some little known facts such as the cemetery that once covered parts of the Civic Center Area and you'll hear chilling stories from those that work the night shift. Would you prefer to venture out on your own? If so, then check out my list of the 10 most haunted places in San Francisco that are open to the public. They range from the woman that roams around Stow Lake in the evenings to the ghosts of City Hall.